Dough, good old Doogh! I can’t begin to tell you how much I love doogh, especially when eating Kabob! They are the perfect pair, like two peas in a pod! 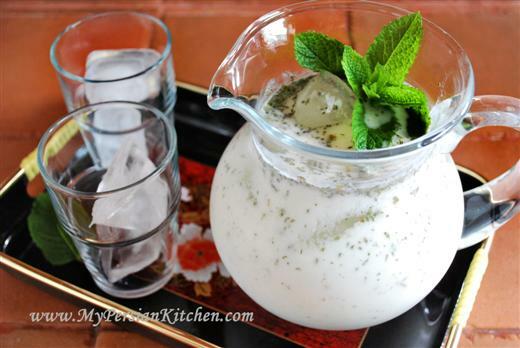 Doogh is a refreshing drink that is made with yogurt, water, and mint. I have shared many times on this blog about my fascination with food, specifically when the same type of dish or drink, albeit slightly different, is made in various countries. Doogh happens to be one of these. A similar variation can be found through out the Middle Eastern countries as well as in some of the European countries. The one variation that most people might be familiar with is Lassi from India. Some people spell Doogh in a different way, they spell it Dough, but I think that the pronunciation can be easily mistaken with the way “dough,” –the paste made with water and flour as a base for bread, pasta, and pizza– is pronounced. The last syllable in Doogh is pronounced the same way the “gh” in the word Baghdad is pronounced. I was taught how to make my very own homemade Doogh by my mom’s uncle Daidaee Fereidoon when I was kid. You can make this drink in two different way, either with seltzer water or flat water. It’s super simple to make and it takes no time! You can either make only one glass for yourself or make a pitcher full of doogh. 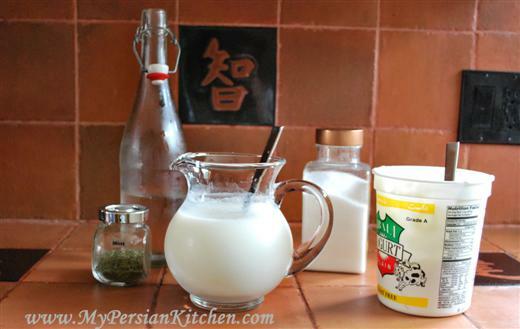 My rule of thumb when making Doogh is to add 1/3 to 1/2 part yogurt to your glass, or pitcher, and top the rest with water. Add a dash of salt and mint. Mix well so that the yogurt is diluted with the water. Then add ice cubes. Add a mint spring on top for decoration. Thanks Sous Chef for sticking your finger in my shot. If you only saw what goes on behind the scenes at MPK and the conditions under which I have to work!!! Like I was saying, place a mint spring for decoration and be sure to serve your Doogh cold. Enjoy your Doogh, or as The Sous Chef would say, Duke…regardless of how many time I have corrected and demonstrated the pronunciation!! We were in Ervine visiting friends where we heard about this site. Everyone were given so many positive comments that we decided to check it out. I must say I am glad we did. It is as good if not better than what we heard. Yiu cannot help it to feel proud to pass it on to all your friends regardless of their ethnic background. Keep up the good work and thank you for all the information you share with us. Love doogh (especially with carbonated water!)! @ Reza jan, thank you for your kind comment. It’s exciting to see that people are speaking highly of MPK and passing it along. I am humbled and happy all at once! Doogh is a very refreshing drink and my favorite summer drink! Beautiful photos! Thanks. I’m a Belgian writer and journalist specialized in Iran, and I LOVE your website. I will spread it! I love Doogh and make it all the time!! I personally think it tastes better when I grind my dried mint into a fine powder before I add it in. @ Azita, Yes indeed Doogh rocks! @ Ann, thank you for your kind complement. Please do pass the website on!! @ Shannon, that sounds like a great idea. I am going to try that next time! Thank you for sharing your tip! came across your blog just the other day and found the doogh recipe. Was just looking for Persian recipes, and the first I came across was this one. I’ve tasted doogh only a couple of times before, didn’t even know it was called like that. I decided to make it the next day, and it was great. Perfect during this heat wave we are experiencing at the moment. It was truly refreshing and light. I’ll continue to experiment with it to find the right amount of salt and mint for the family. Thanks! And I’ll be sure to keep checking your blog regularly. Great recipes, instructions and pictures. Much appreciated, from a non-Iranian Persian-cooking fan. Sharon, thank you for your kind words. I am so happy that you have found my blog and that you are using my recipes! Have fun experimenting!!! I had a little difficulty explaining the doogh to one of my dear American friends. Thanks for doing the job so vividly. I have now referred her to your blog. I may only add one thing. Since salt is a bit of a hazard to our health, we keep the yogurt outside the fiidge for one, two or three days in order to make it a bit sour. Sour yogurt needs less salt I think. Alireza jan, Good option. I had not thought about substituting salt by decreasing the sourness of doogh! Thank you for sharing! Hi, awesome website ! I just came across with it trying to find how to make doogh from scratch! I heard there’s is another way to make! I’m not really sure, but I heard there is this sort of yogurt cultive that you can add to make it ferment and make the texture sparkling like with out adding sparkling water to it! 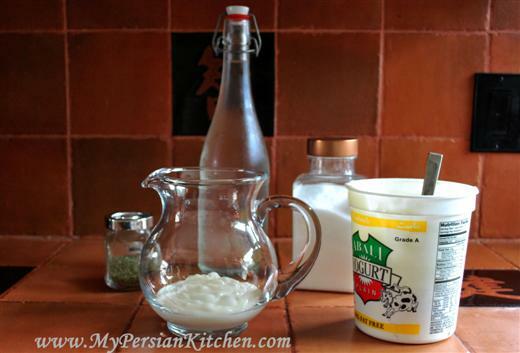 Are you familiar with this other method to prepare doogh? Beba, I have heard of it, but I have never done it that way. i add some dried persian rose to the doogh. I’ve been going to Super Irvine on Culver in Irvine, CA every week for months on end to get my “fix” of a half-gallon. Now I can make my own. Thanks for posting a recipe Ahhhh…. Dooooooghhhh !!!! mix unboild milk with same amount of water in a bottle, add some salt and maint .tie the lid of the bottle then keep it in a warm place for two-three days. hi all.im so happy that everybody is drinking doogh nowadays.i love doogh so much.im crazy about it.a new idea to add some things to your doogh.u can add some dried pennyroyals to your doogh.do that and just enjoy. Is there a way to get doogh tasting like the real authentic stuff that you get in Iran. The really sour (and gone off) taste? Salman, the type of yogurt that is used pretty much dictates the taste of the the drink. So if your yogurt is sour, then your drink will be sour. can we add seltzer instead?? Is Doogh the same as Kefir? Here in Australia anything ‘different’ is always hard to find or not available. Your recipe is an added taste to love and enjoy, thank you. Dazzle, I suppose they are somewhat similar in the sense that you drink them. Hi I just read an article that a test had been done to see if Doogh can help with Diabetes induced inflamation….AND it Does !!!! I Googled Doogh recipe and your site came up. Thank You So Much for the recipe as I had never heard of it before. Does it matter what kind of yogurt to use? I did forget to say that the Doogh they used was fortified with Vit D.
When I was pregnant with my son I craved doogh like crazy, I would carry it around with me all the time. YUM. Hi there, actually, this is recipe for “yoghurt and water”. What I mean is, the cultures present in real doogh are very different to that of yoghurt. 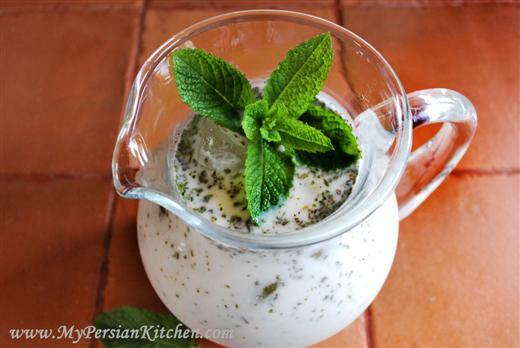 Persians drank fermented milk with salt and dry mint. 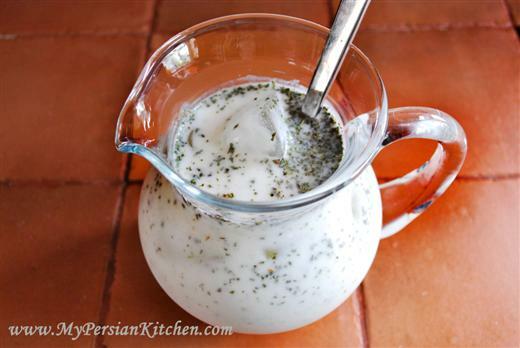 Not yoghurt mixed with water… that is why when you make it at home, it NEVER tastes like real doogh you get in Iran!!!! But don’t worry, you can make it easily. Just add about 1:5 (i like thicker I use 1:3.5) ratio of water and yoghurt (preferably sour, dont bother with greek), pour into a used soft drink bottle (make sure you clean it very well, rinse with vinegar to get rid of all chemical residue). Close the lid very tight. The reason why I say soft drink bottle is because the fermentation results in a lot of gases that will explode or seep out if you use something like a milk carton. Then, leave it at room temperature for about 4-5 days (yes you heard right). The fermentation will result in delicious, fizzy doogh which has the bitey traditional taste you would get directly from Iran. DISCLAIMER: Try at own risk, if you are not ultra hygenic you may end up growing other dangerous bacteria… so try at own risk. If you see any discoloration, grey, mould, etc, then you had contaminants, throw it away. If you have consistent, pale white doogh, that sort of separates like whey, then you are in business!!! Arvin, that makes so much sense it tickles me. I’ve long been wondering how to make doogh without the mint all floating to the top, and how to leave the mint in there long enough to flavor it but not let it sit so long that the carbonation goes away. I believe you may have solved it all for me. I’ve made my share of fermented food and drinks, so I’ll give this method a try. One of many good things about lacto-fermentation is that, if unfriendly organisms should take up residence and multiply, it will make it smell so foul that nothing could convince you to drink it. I’ve been using your website for a while now and I love it! It’s so great to be able to make the foods I grew up with and share them with my wife and kids. One day, when I open my own Persian restaurant, I’m going to be borrowing heavily from here! I was wondering if you had ever experimented with making your own yogurt from scratch? I remember my mom making it often, it involved heating milk in a big pot and adding a bit of preexisting yogurt to get the process started, then wrapping the whole thing in many towels to keep warm and setting aside for a good long while. Have you ever heard of any method like this, and if so would you consider posting a detailed description? I looked through your site and couldn’t find anything like that, although maybe I just didn’t look hard enough. Anyway, thanks for all your hard work! hi , thank u for the great website .. i know how to make doogh its pretty simple a good drink with a lot of health benefits. there are many other ways to make this drink you can make it fizzy if you leave it in a warm place for afew days and then leaving it under the sun for another day .. u also need to add a little sugar to keep it fizzy during the process. Ehsan, I have experimented with making my own yogurt and it was not a successful venture….I think I might have used the wrong type of yogurt. But I will go back to trying this year! Thanks for the recipe! I added some lemon juice and a little black pepper to your recipe and got the flavor I was dreaming about…probably not authentic but what would I know from authentic?! I was wondering, is there a preference for the type of mint? The store I went to only had dried spearmint. I can go to the hippy herb store next time and get any one of a million types of mint so I am wondering is there some kind of super Persian mint variety out there or will any kind do? 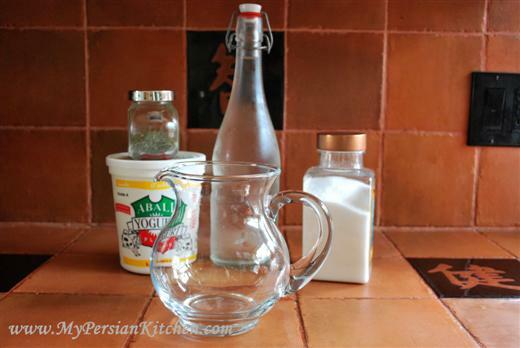 Hi, I love this great website where I can get all kinds of Persian recipes. I love Mast Museer and have been looking for the proper way of making it. Everywhere it just says use shallots however shallots do not give the right taste. If you please share the recipe of Mast Museer I will be ever grateful! First, make sure all your utensils, containers or anything that may come in contact with the mixture is clean. -Heat up the milk. About 45-50 c is good but no more! stir it every once a while so it would not cake at bottom and burn. -Once the milk has reached the ideal temperature, take it off the stove and let it cool for a few minutes. -Test the temperature. Couple of degrees above or below body temperature is perfect. Pretend you’re going to feed an infant and checking if the milk is warm enough. -Add the water and the yogurt to the milk, mix them all together. Pour the mixture into your container, seal it tight and make sure no gas is going to escape. -Put the container in a war place, about 30 degrees. Oven light works pretty well provided no one opens the door too often. Keeping the temperature at a constant level is the key here. -Let it sit for 2 days. -Day 4-5, final check: taste the dough. Add some salt to your sample and see if its to your liking. If however it smells and tastes like cheese water, then you tow it away. Something has gone wrong. Hi I love your website and found plenty of inspiration here for my cooking.I make dough almost everyday as my hubby is Kurdish and he likes to have it with dinner .Kurdish simply call it mastaw. 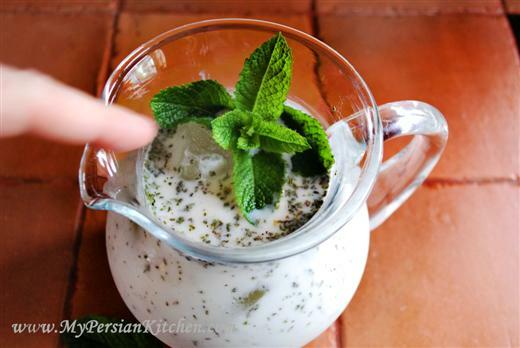 I add fresh mint to my one and leave the drink to infuse in the fridge I also add sprinkle of bicarbonate soda to give it slight tartness and a bit of fizz.I found this tip in one of my iraqi cook books.By the way I m Polish and we have similar drink in Poland but is made with milk which is aloud to get sour in warm place.I know it may seems strange but is lovely aspecialy in hot weather.We also enjoy kefir and buttermilk which we even aloud do fruits into.